What is the role of retired professors and emeritus professors in Education? All papers must follow the WSEAS format. Papers that are not in the correct format will not be considered for publication. All papers are reviewed by 2-5 independent reviewers. The estimated review time is 3 to 6 months. The Editor in Chief will inform you of the review result as soon as it's available. By submitting a paper, you automatically declare that the paper has not been submitted, accepted, published or copyrighted elsewhere - including WSEAS Conferences. No fee is required for publishing a paper in a WSEAS journal. 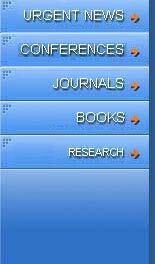 No hard copies are given to the authors as the journals are only published online. The subscription rate for each journal is 400 Euros plus shipping costs per year for individuals or 500 Euros plus shipping costs per year for institutions or companies.